Liftoff from Vandenberg Air Force Base in California came at 10:49:47 p.m. local time (1:49:47 a.m. EDT; 0549:47 GMT Sunday) after an eight-hour countdown. Rapidly departing the launch pad and powering to the southeast on a coast-hugging trajectory, the 197-foot-tall rocket burned four solid-fuel boosters in addition to its kerosene-fed main engine for 2.4 million pounds of thrust to dazzle in a spectacular ascent. 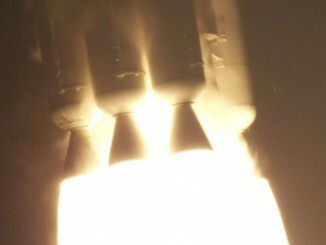 The launch was known simply as NROL-42, a top-secret satellite-delivery flight for the U.S. National Reconnaissance Office. The NRO is the government body that controls the country’s spy satellites. Within a few minutes of takeoff, the launch disappeared into the now-customary news blackout for national security reasons. About two hours later, officials announced a successful outcome had been achieved. It marked the 144th consecutive successful Atlas program launch spanning more than two decades, the 73rd for an Atlas 5 and the 121st for United Launch Alliance. What’s more, it was the 25th mission ULA has successfully performed for the NRO. “NROL-42 marks the 25th ULA-launched NRO mission, building upon our legacy of partnership with the NRO in providing reliable access to space for our nation’s most critical missions,” said Laura Maginnis, ULA vice president of Government Satellite Launch. The identity of the payload launched was not released to the public. But conventional wisdom said this was the second satellite in a new generation of electronic signals intelligence-gathering spacecraft, informally called Trumpet. It will operate in a Molniya-style orbit of approximately 1,000 by 24,000 miles, tilted 63 degrees to the equator. “We think these satellites carry a signals intelligence (possibly mainly communications intercept) payload and an additional missile early-warning payload,” said Jonathan McDowell, an astronomer at the Harvard-Smithsonian Center for Astrophysics and noted space historian. This deployment builds upon 46 years of launching an evolutionary series of platforms into a similar kind of orbit aboard Titan rockets, and the Delta 4 and Atlas 5 more recently. The orbit got its name from Soviet and Russian Molniya communications satellites that have occupied this space since the 1960s. It takes 12 hours to complete one revolution, and the spacecraft enjoy several hours before and after apogee “hanging” high above Russia, Canada, northern Europe and Greenland. “The Molniya orbit satellites complement similar geostationary ones by providing better coverage over the north pole. 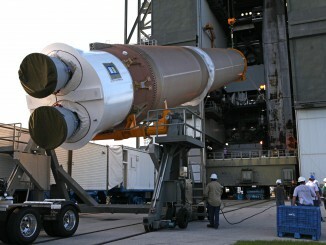 The satellite will spend most of its orbit near apogee,” McDowell said. “For most elliptical orbits Earth oblateness (the flattening of the Earth at the poles) makes the apogee’s latitude change with time, but the magic of the Molniya orbit is that it instead leverages the oblateness to lock in that apogee at a fixed latitude. The NRO began sending up eavesdropping satellites to Molniya orbit, known by the codename Jumpseat, in 1971 to surveil Soviet radar transmissions. After five successful launches in the 1970s and early 1980s, the lineage moved to three much-larger Trumpet satellites launched by Titan 4 rockets in the 1990s. Two follow-on missions, requiring smaller boosters, were lofted a decade ago by Vandenberg’s first Delta 4 and Atlas 5 launches. The newest generation likely started with the NROL-35 launch on the more powerful Atlas 5-541 in 2014. “U.S. signals intelligence satellites have demonstrated long service lives. Recent observations by my colleagues Peter Wakelin and Brad Young reveal that all six previously launched Trumpets continue to maintain operational orbits. They consist of the first generation satellites launched in 1994, 1995 and 1997, and the follow-on satellites launched in 2006, 2008 and 2014,” said respected satellite observer Ted Molczan. Also, NROL-42 likely carries the military’s fourth Space Based Infrared Systems-HEO early-warning missile alert sensor. SBIRS is a global network that covers the entire planet with persistent monitoring to detect and track adversarial missile launches. The system is on constantly vigil to alert the U.S., its deployed military forces and allies of a potentially deadly missile launch taking aim. The Air Force says SBIRS HEO-4 completes the replenishment of the U.S. military’s polar missile warning capability. 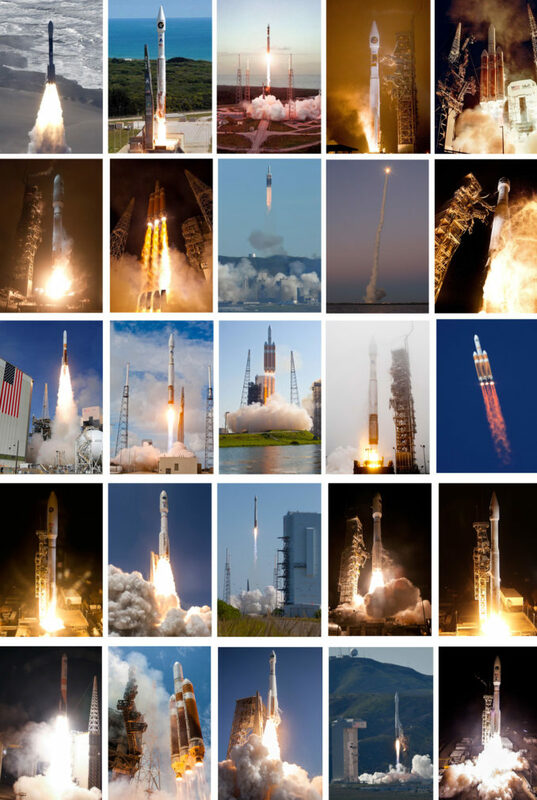 Now having served the NRO successfully 25 times, ULA will strive for No. 26 on its next mission. The NROL-52 launch aboard an Atlas 5-421 rocket from Cape Canaveral will occur Oct. 5 some time between 3 and 7 a.m. EDT.